Imagine a machine that could wipe a game totally from your memory just so you could enjoy it again for the first time. Imagine the experiences you could relive; seeing dark world for the first time, finally finishing first on rainbow road or even making it to level 2 on SuperProbotector. Obviously this wondrous machine doesn't exist but I have found something close - watching my daughter see the games I loved as a child for the very first time. I'm very careful about what I play when she's about since the vast majority of current generation games are hilariously inappropriate for a three year old to see. But there are things she's dabbled in. She's grabbed a mic for a bit of SingStar, pushed me off the balance board to try WiiFit skiing and even wiggled her bottom (literally) to a toddler dancing game called ‘Poo Yoos’. None of these are 'real games' in the traditional sense and her interest in these ‘casual games’ is very recent. Being at home on paternity leave has afforded me time on the big TV to play snes games, sometimes (if it’s not something that will give her nightmares) when my daughter is about. One day while playing Unirally I heard the words every geeky father wants to hear "me play ooo addy", I looked down and realised I had a smiling controller clutching co-op partner. Unirally was a good start for her, a game that can be played by only pressing a direction button. The problem was she couldn't do the stunts and therefore posed very little competition for me in the races. After a few minutes (of her not only having to endure defeat but also my victory dances that followed) she put the controller down gently and said "no, don't like that". She went back to her puzzles I went back to being beaten by the computer and doing a very different dance. Her next choice of game was a far better fit. One morning I was playing Mario World, she was dancing to the timeless catchy background music. Exhausted after a particularly energetic routine inspired by the ragtime style level music, she decided perhaps it best to investigate the source of this melody rather than just dance to it. As she looked up at the screen she literally gasped, "wow" she exclaimed. For a three year old Mario World looks astonishing. Every colour the Super Nintendo can produce is thrown up on screen and the sprites are spinning, scaling, rotating in all sorts of crazy Mode 7 ways. 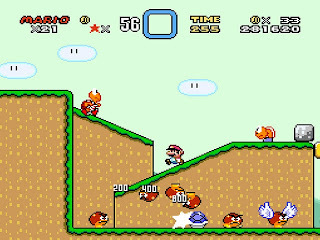 Super Mario World needed to look good of course because it had to show off everything Nintendo's new console could do. As the original pack-in game every new Snes owner probably put this game in first, and socks would have been blown off in a manner not unlike my daughter seeing it for the first time. games only now they are inching closer to the box art and what the concept artists always intended. Mario World may leave my toddler daughter with mouth ajar but even to those who have spent a lifetime playing games it's clearly a wonderful looking game, even now. 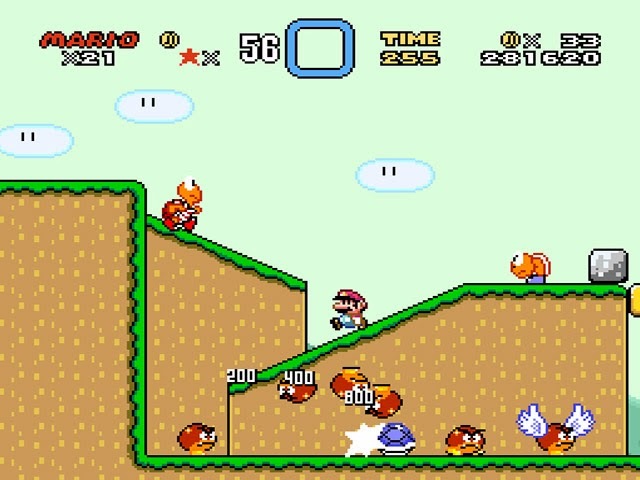 It's telling that so many graphical styles that have become series staples have their roots in Mario World, everything here visually fits together so perfectly. Mario World is a marriage of style and function. Its clear where platforms end and where sprites stand both of which are prerequisites for a successful platform game. The improvements over Mario 3 are far more the visual flourishes and more elaborate (albeit less catchy) music. Due to the simple reason that there was more buttons on the controller Mario could now do more things, spin jump and more precise flying being two examples. But the biggest addition to the franchise came in the form of your trusty steed Yoshi. 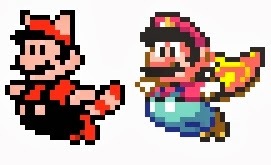 Mario 3’s gimmick was the idea that numerous different suits gave numerous different abilities but these are stripped back in Mario World. Instead it is the skills that came courtesy of Mario's new friend which would change the series forever. Along with giving the player an extra hit of health and adding bongos to the background music Yoshi also had a versatile tongue. This one game play mechanic presented all sorts of opportunities for designers to pepper secrets in as many places as possible. 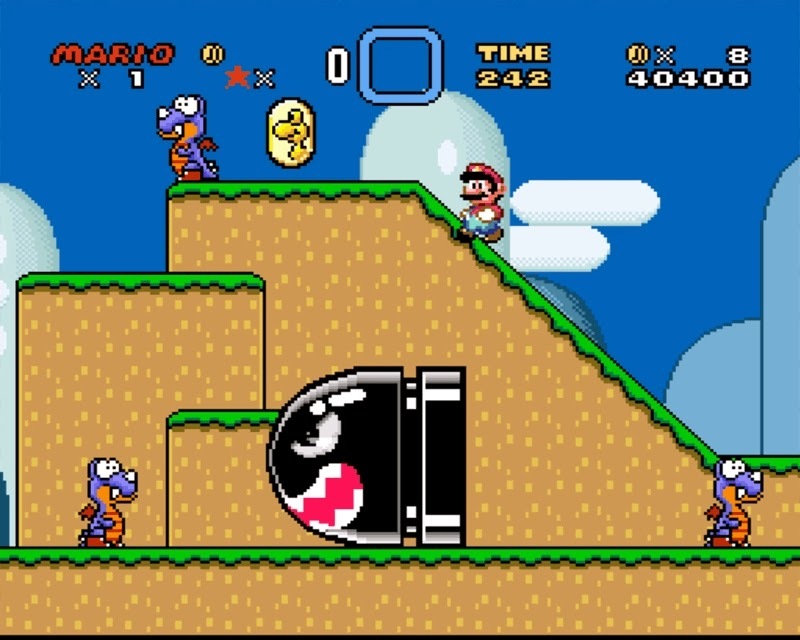 These hidden areas, obscured bonuses and alternative level exits really are Mario Worlds trump card. In an interview with 'The New Yorker' Magazine, Shigeru Miyamoto discussed this approach to level design. “To what extent are you going to hide the secrets?” he said. “In order for a mystery or a joke to work, we have to provide the necessary amount of information. Not too much, not too little, but the perfect balance. So that in the end people can feel, how come I didn’t realize that? ... it’s the players who have to find their own road to the end.” The joy comes in the exploration, optional at the start but required by the time you get to The Forest of Illusion. Never before had a platform game felt so intricate, so deep, so rewarding. Despite all its pretty graphics, quirky dinosaurs and jolly tunes its superior level design that cemented Mario World as not just a better game than Mario 3 but also meant it has become the bench mark that all other 2d platform games are compared against. Although the game's own packaging and popular opinion seemed to believe there were 96 of these masterfully crafted levels in reality there were only 72. The 96 in fact relates to the total number of ways you can finish the levels meaning there were 24 hidden exits to be found. The reward for finding these hidden exists varied; it could offer a short cut through the world or just as likely a short cut through the entire game. 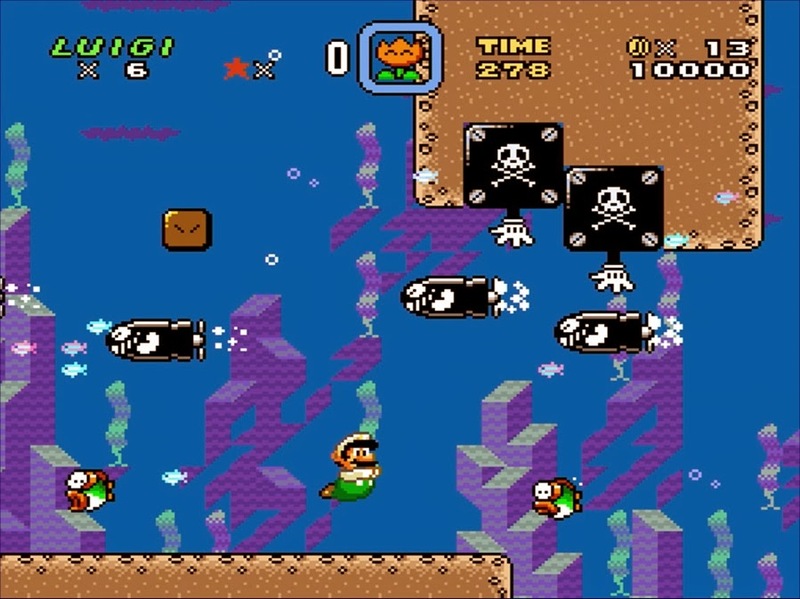 It was actually possible to finish Mario World by just passing through 12 exits. I remember exchanging tips in the playground with other players, as we one by one found the hidden Star Road levels and then the Special Stages. I distinct remember when I first finished the game a feeling that the journey had only just begun rather than reached an end. Every red level dot on the map meant the stage had more than one exit, and I meticulously went through them one by one till all 96 had been found. Mario World therefore had huge longevity, giving a 'collect-em up' idea to platform games that still exist in games such as Little Big Planet today. Despite all these game play additions Mario World remained a game most could still pick up and play, as proven by my daughter. Watching her play for the first time was itself a treat. She had seen Daddy make this funny little moustachioed man do all sorts of feats and was keen to discover how this had been achieved. Holding down the d pad made him move, what a discovery. If she held the right button he'd run right and switching to the left D pad made him shift on the opposite direction. A little giggle came out as she could see the result of her button pressing reflected on screen. But that wasn't all, she knew this plumber could jump and seeing the other buttons pressed them all till the desired result was achieved. It was very sweet watching her realise this all. 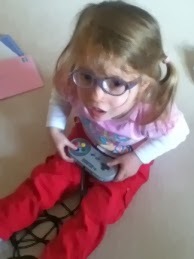 Although she wasn't able to play the levels in any meaningful way she just loved bouncing Mario around. I like to think she has good taste and can appreciate just how magnificent this game is. Considering it was a launch game, it's amazing that throughout the entire life of the Snes just a handful of games managed to meet its quality. The system's incredible library is known as one of the greatest in the history of the industry and one of its first titles one of the best platform games most have ever played. it was first releases be it on Virtual Console or on the Gameboy Advance. Each time I approach it it’s with a certain amount of trepidation however. 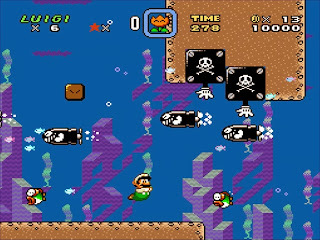 Ironically since so many different innovations have been copied in so many different games there's a danger that Mario World will feel unsurprising and predictable. Fortunately this never is the case. The winding paths and hidden exits of Dinosaur Land are fun to revisit, the core of the experience still a pure Nintendo joy. Each time I play it feels like slipping on a warm familiar nostalgia soaked jumper and it’s just nice to see where the adventure takes me. Sometimes I’ll try to get to the end as quickly as possible, other times I'd go the long way playing all the worlds using conventional exits. My latest play through was my favourite way, entering star road via Soda Lake as this route requires the most flamboyant techniques. Star Road then leads to Bowser’s Castle and that oh so memorable boss battle that still gives me sweaty palms even after the countless times I've beaten him. It's not a lengthy game but every second is a treat. I wonder which way my little one will choose to go when she learns that she can move and jump at the same time. I just hope she can stand a back seat driving Daddy. He can't play it for the first time but will be sharing every one of her discoveries and her victories. There is a weirdness to the price of a boxed complete Mario World on eBay. Its a game everyone had yet it’s also one that carries a price tag equal to that of when it was first released. This is no doubt due to one of two simple reasons: Everyone remembers this game so want to replay it or that everyone has heard this game is amazing and wants to play it for the first time. As an original pack in game, there were actually very few boxed copies about initially. Those who had it free with the Snes console had it loose, and it wasn’t until other Console bundles were released that Mario World saw a stand-alone boxed release. Ironically for a game that was owned by everyone, the ‘Yellow Box’ copy actually has become therefore rather rare. It’s been on my eBay watch list since I started collecting Super Nintendo games and one day (while on holiday actually) it was listed by someone who didn’t realise the box was actually worth more than the cartridge. A bargain Buy It now price, and it’s in my collection. I am also proud to say the battery backup can testify that I have already got all 96 exits – God bless paternity leave and night feeds! To say I love Super Mario World is an understatement. It's the game that made me the gamer I am today...Viva Mario! !